Deaf Bible Society would like to say thank to the interpreting community for all of their support! We are hosting a FREE interpreting workshop on Saturday. November 10, 2018. 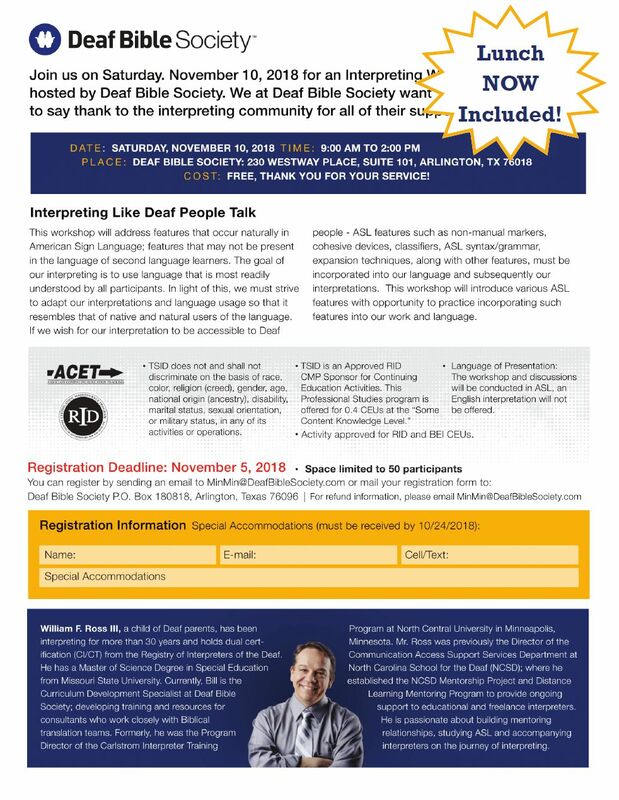 Host by Deaf Bible Society, located at: 230 Westway Place, Suite 101, Arlington, TX, 76018. Time: 9:00 AM TO 2:00 PM Limited to 50 participants, a soup and salad lunch is included. This workshop will address features that occur naturally in American Sign Language; features that may not be present in the language of second language learners. The goal of our interpreting is to use language that is most readily understood by all participants. In light of this, we must strive to adapt our interpretations and language usage so that it resembles that of native and natural users of the language. If we wish for our interpretation to be accessible to Deaf people – ASL features such as non-manual markers, cohesive devices, classifiers, ASL syntax/grammar, expansion techniques, along with other features, must be incorporated into our language and subsequently our interpretations. This workshop will introduce various ASL features with opportunity to practice incorporating such features into our work and language. TSID is an Approved RID, CMP Sponsor for Continuing Education Activities. This Professional Studies program is offered for 0.4 CEUs at the “Some Content Knowledge Level.” Workshop will be taught in ASL, no voice interpretation provided.